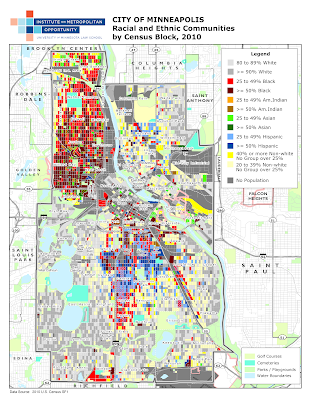 A while back we posted a few maps showing racial transition in Minneapolis over 20 years. Today, we've got a couple more with a similar theme. The new maps, which include both Minneapolis and Saint Paul, still use 2010 block-level U.S. Census data. But this time, they show residential demographics by racial category, instead of broadly classifying residents as white or nonwhite. 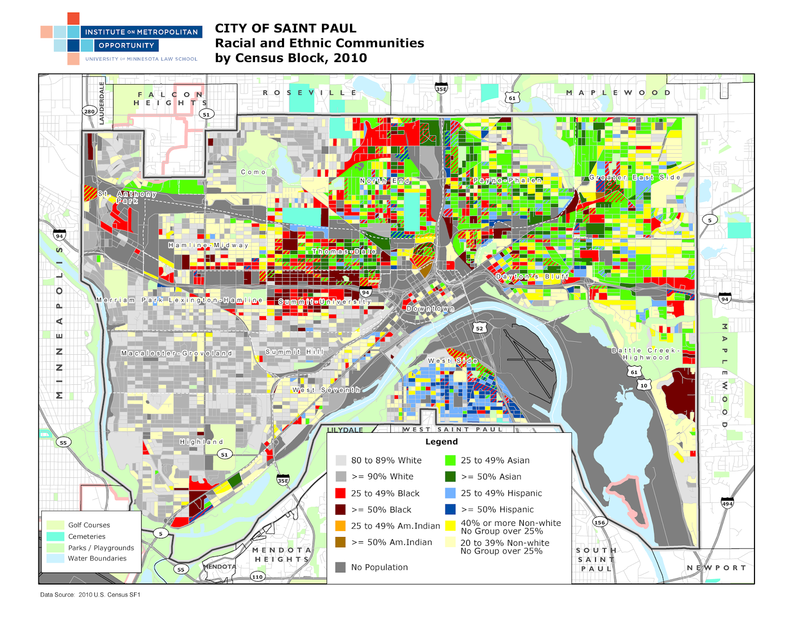 The result is a more detailed view of racial living patterns in the cities. 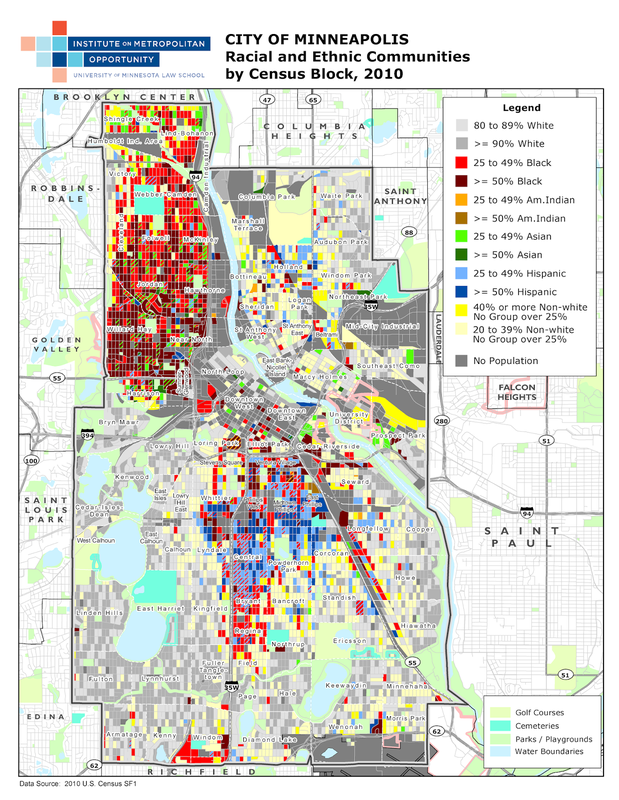 Discernible racial concentrations are immediately evident - black residents are concentrated in north Minneapolis, Hispanic residents in south Minneapolis, and Asian residents in east Saint Paul. But there's a major caveat here: segregation still breaks down most clearly along binary "white or nonwhite" lines. Nonwhite racial concentrations are considerably more fragmented, and less defined, then the stark split between predominantly white areas and everywhere else. Within predominantly nonwhite areas, the primary racial group (when there is one) often varies block-by-block. By comparison, huge swathes of each city are overwhelmingly white, despite the explosive growth of racial and ethnic diversity nearby. This is no accident, but the product of decades of public and private-market discrimination, often designed to ensure that white neighborhoods stay that way. There are still frequent efforts in policy circles to characterize segregation as, at least in part, the result of choices made by the groups being segregated - the manifestation of individual preferences for living "with one's own race." As these maps show, that is inaccurate. Segregation remains, first and foremost, a manifestation of America's long history of white supremacy. It is imposed by outside forces, not self-imposed from within.